The original reference resource for medical oncologists, radiation oncologists, internists, and allied specialties involved in the treatment of cancer patients, Holland-Frei Cancer Medicine covers the ever-expanding field of current cancer science and clinical oncology practice. In this new ninth edition an outstanding editorial team from world-renowned medical centers continue to hone the leading edge forged in previous editions, with timely information on biology, immunology, etiology, epidemiology, prevention, screening, pathology, imaging, and therapy. 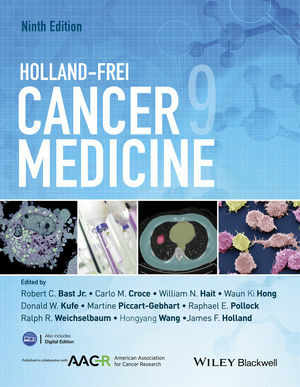 Holland-Frei Cancer Medicine, Ninth Edition, brings scientific principles into clinical practice and is a testament to the ethos that innovative, comprehensive, multidisciplinary treatment of cancer patients must be grounded in a fundamental understanding of cancer biology. This ninth edition features hundreds of full color illustrations, photographs, tables, graphs and algorithms that enhance understanding of complex topics and make this text an invaluable clinical tool. Over 15 brand new chapters covering the latest advances, including chapters Cancer Metabolism, Bioinformatics, Biomarker Based Clinical Trial Design, Health Services Research and Survivorship bring this comprehensive resource up-to-date. Each chapter contains overview boxes, select references and other pedagogic features, designed to make the content easy to access and absorb. The full list of references for each chapter are available on the free Wiley Companion Digital Edition. Edited and authored by an international group of some of the best-known oncologists, cancer researchers, surgeons, pathologists, and other associated specialists in the world, and endorsed by the American Association of Cancer Research Holland-Frei Cancer Medicine offers a genuinely international view of cancer research and clinical oncology practice. James F. Holland, Raymond S. Lance, Donald F. Lynch Jr.
Jonathan S. Berek, Michael L. Friedlander, and Robert C. Bast Jr.